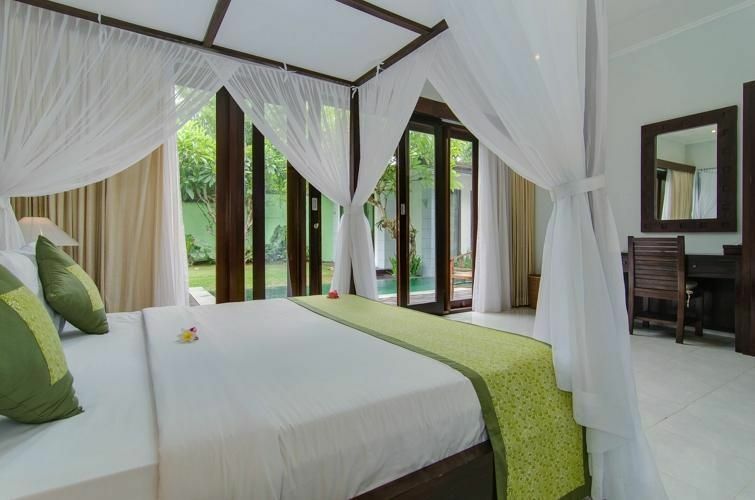 VILLA II is a 3-bedroom Bali holiday rental villa, located in central Seminyak, about 5 minutes away to the famous Kudeta beach restaurants, 15 minutes walk to Seminyak beach and within immediate walking access to shops, restaurants and other interesting place Seminyak has to offer. Accommodation and facilities include three air-conditioned fully airconditioned bedrooms and ensuite bathrooms. A semi fan-cooled open-plan living and dining area with Stereo system, DVD player and Cable 29" LCD TV. Kitchen with breakfast bar and well equipped. Private 7 meter swimming pool with lounge sun decks and tropical garden. 2 king size bedrooms at the main building, both with ensuite bathroom, shower and bath-tubs. The 3rd bedroom is located at the adjacent guest cottage complete with queen size air-conditioned bedroom and en-suite bathroom. A semi fan-cooled open plan living and dining area with private pool and garden view.